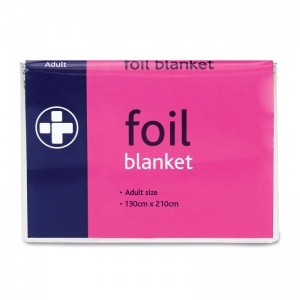 Disposable and highly insulating, the Adult Size Foil Survival Blanket is the perfect item to have during an emergency evacuation scenario. Designed to retain body heat during adverse weather conditions, they can help to prevent hypothermia while shielding the victim from wind and rain. Both sides of the heat-reflective metallic surface of the emergency blanket is designed to retain over 90% of body heat, insulating the user and providing minimal heat escape. The blanket provides superior protection against the elements, aiding in the treatment or prevention of hypothermia when users are outside. The reflective nature of the blankets will also reflect light, meaning that the user can been seen from great distance by rescuers or emergency services. The survival blanket has been created to fit any adult, and are optimal for outdoor use, proving to be helpful for sporting or general outdoor events such as festivals or fairs. It is a valuable resource to pack in any first aid kit, proving to be a potentially life-saving product during emergency situations. The Adult Size Foil Survival Blanket is usually dispatched via First Class Royal Mail and delivery should be within 1 to 3 working days.